The closures will be in place for the rest of the year. ST. LOUIS — New lane closures start Monday morning on Interstate 44. It’ll impact traffic between Kingshighway and Grand for the rest of the year. MoDOT crews will close one eastbound lane in that stretch from 9 a.m. to 5 p.m. They’ll be working to restripe the interstate into four lanes. From 7 p.m. to 5 a.m., crews will close an additional lane to set up the barrier wall for the new temporary median. MoDOT is doing its best to avoid disruptions during the morning and evening rush hours. This is all part of the second year of a construction project to update several bridges on I-44 in the city between Kingshighway and Grand. Crews are working on the westbound bridges this year. More lane closures and shifts are expected this weekend. On Saturday starting at 8 a.m., crews will close two westbound lanes and shift the remaining two lanes onto the eastbound interstate. 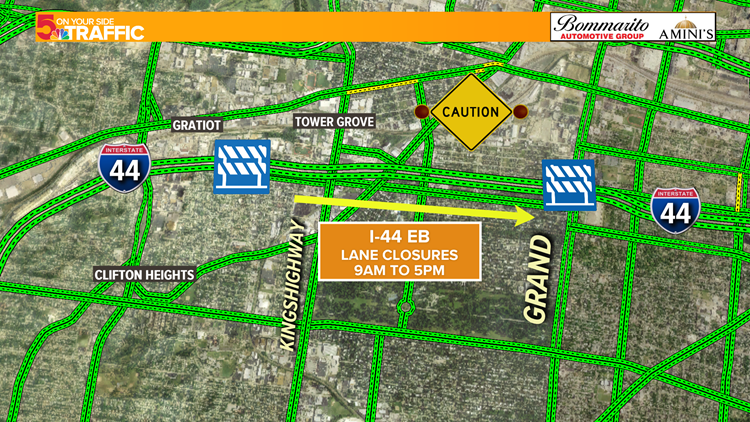 They’ll also close the Vandeventer and Grand ramps to westbound I-44. When it’s all done Saturday evening, there will be three eastbound lanes and two westbound lanes along that stretch for the rest of the year. The Vandeventer ramp to westbound I-44 also will remain closed for the rest of the year. The Grand ramp to westbound I-44 is expected to reopen in three months. Drivers who use I-44 in their daily commute are urged to find other routes or give themselves extra time to get where they’re going. For more details about MoDOT’s I-44 bridge project, click here.